TOBRUK, Libya - Muammar Qaddafi's forces intensified offensives in the east and the west Wednesday with relentless shelling aimed at routing holdout rebels and retaking control of the country he has ruled with an iron fist for more than four decades. As Qaddafi's forces advanced on their eastern stronghold, the rebels lashed out at the West for failing to come to their aid. "People are fed up. They are waiting impatiently for an international move," said Saadoun al-Misrati, a rebel spokesman in the city of Misrata, the last rebel-held city in the west, which came under heavy shelling Wednesday. Scoring wins, Qaddafi tells rebels: "Surrender"
"What Qaddafi is doing, he is exploiting delays by international community. People are very angry that no action is being taken against Qaddafi's weaponry." An international diplomatic push to create a no-fly zone to prevent Qaddafi from bombing civilians has so far failed, although French Foreign Minister Alain Juppe said Wednesday that several unspecified Arab countries have pledged to participate in possible military action in Libya. Residents fled the strategic city of Ajdabiya, 480 miles southeast of Tripoli, as a bombardment continued for a second day and a breakdown in rebel defenses threatened to open the gateway to the long stretch of eastern Libya that has been in the control of the opposition throughout the monthlong uprising. Rebels braced for a possible attack on the next major city in the east, Benghazi, Libya's second-largest city and the birthplace of the monthlong rebellion, which began with protests in the city by opposition activists emboldened by successful uprisings in Egypt and Tunisia. Qaddafi's son, Seif al-Islam, warned the rebels the regime was closing in on them and urged them to leave the country. "We don't want to kill, we don't want revenge, but you, traitors, mercenaries, you have committed crimes against the Libyan people: leave, go in peace to Egypt," he said in an interview with Lyon, France-based EuroNews television. "Military operations are over. Within 48 hours everything will be finished. Our forces are almost in Benghazi. Whatever the decision, it will be too late." Mustafa Gheriani, an opposition spokesman, said rebels in Benghazi would be ready for an attack. "A large percentage of Benghazi's population is armed. Can Qaddafi bomb the city? Sure he can. Can he go in? I don't think so," he told The Associated Press. "Also, I think it is too far for his supply lines." Gheriani said anti-aircraft equipment has been deployed, and the army mobilized, although he didn't know where. There have been few signs in recent days of the rebels digging in defensive preparations on the city's outskirts. An activist hiding out in the city said the rebels were lightly armed but managed to ambush a group of regime troops marching into the city on foot late Tuesday, but the victory was short lived. Artillery shelling was ongoing, he said. "The rebels set a trap and managed to take over four tanks, but now I see none of them," Abdel-Bari Zwei said when reached by telephone. "Ajdabiya is witnessing unprecedented destruction. This is the end of the city." Residents in Ajdabiya fled either to tents set up outside the city or 140 miles northeast to Benghazi. "The shelling hasn't stopped since last night. The residential areas are under attack," Zwei said, adding that the hospital had been overwhelmed and many of the injured had to be taken to Benghazi. The city was besieged from the west, where Qaddafi's brigades were deployed from his stronghold of Sirte, and from the north with a warship in the Mediterranean Sea. "The city is sealed off from the south, from the west and the northern Zwitina port by a warship," he said. Libyan state television aired calls for the opposition to stop fighting, apparently hoping to sway populations in the east away from support of the rebels. Ajdabiya has been a key supply point for the rebellion, with ammunition and weapons depots. Until now, the Qaddafi forces' offensive toward the east has battled over two oil ports on the Mediterranean Sea, and Ajdabiya is the first heavily populated city in the area they have tried to retake. 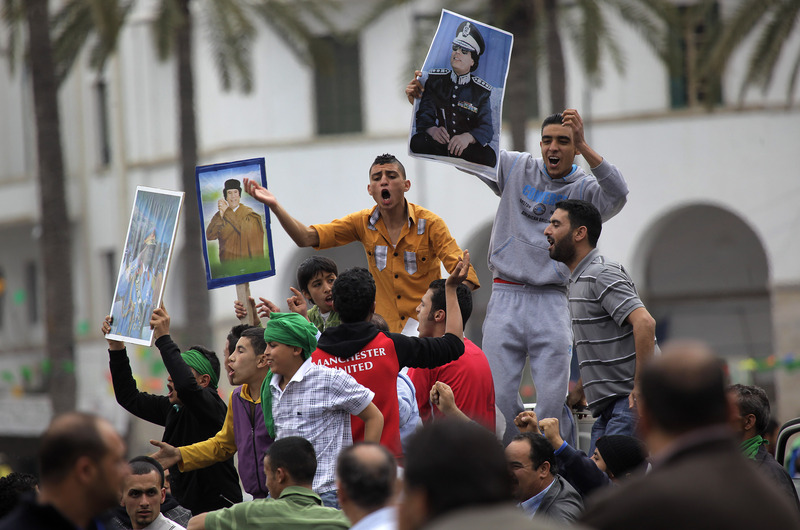 Its loss was a major setback to the rebels, who less than two weeks ago were poised to march on Tripoli, the capital, and had appeared capable of sweeping Qaddafi out of power, inspired by successful uprisings in Egypt and Tunisia. But the regime's better armed and organized military has reversed the tide. Oil prices rose to above $98 a barrel Wednesday in Asia as fears that clashes in Libya and the Gulf kingdom of Bahrain could further disrupt crude supplies outweighed concern Japan's disaster will crimp demand. Qaddafi's forces also launched an attack on Misrata -- which for days has been under a punishing blockade, its population running out of supplies. The barrage came a day after the government recaptured the last rebel-held city west of Tripoli, solidifying his control over the coastline from the capital to the Tunisian border. "There is coordinated shelling by Qaddafi's brigades firing artillery and machine guns from three different city entrances," rebel spokesman Saadoun al-Misrati said, speaking by satellite phone. He said the shelling began at 7 a.m. and regular telephone lines had been cut. France was pushing for rapid action as supporters of a no-fly zone over Libya worked to persuade Russia, Germany and other reluctant members of the U.N. Security Council to back a resolution aimed at stopping Qaddafi's planes from bombing civilians. The French foreign minister wrote on his blog Wednesday that France and Britain have sought targeted air strikes for two weeks and said two conditions are necessary: a Security Council mandate for such force and "effective" participation by Arab states. "Several Arab countries assured us that they will participate," Juppe wrote, without elaborating.